More than 40 years ago the ATSG acquired a Scale Structure Limited Sterling Colorado Round House kit. The Roundhouse served on an early version of the ATSG railroad for a number of years. The railroad was moved in 2006 and began reconstruction in 2009. The roundhouse was removed from its crate where it had been packed for more than 5 years. The construction crew in those early days were far less skilled than our current crew. 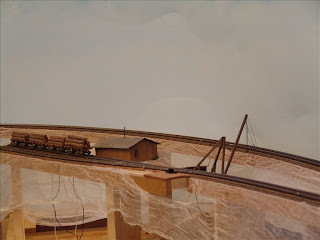 When the roundhouse was put in place next to the turntable it was apparent that the construction standards did not meet the new building code for the railroad. 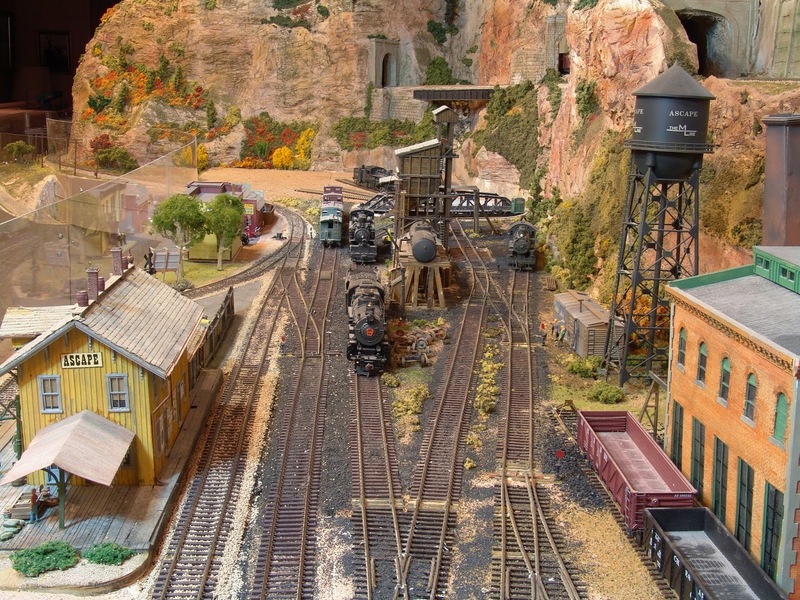 Doug Whetstone, a member of the Color Country Model Railroad Club and operator on the ATSG volunteered to reconstruct the roundhouse to bring it up to code. He completely disassembled the previous round house, discarded everything but the metal parts including the windows, doors, roof vents and details. He repainted all of these metal parts using paint that he had on hand. He reconstructed the right wall of the building using foam core covered with embossed stone paper. The new wall looked great. But then the press of other responsibilities prevented him from further construction for a couple of years. The management of the ATSG finally revoked the contract and retrieved the building parts for later reconstruction. Reconstruction of the Ascape roundhouse was resumed in 2015. Using the pattern of the right wall constructed by Mr. Whetstone, the construction crew of the ATSG went to work reconstructing the remainder of the building. Using plans from the original kit a floor complete with simulated pits was designed to correspond with the turntable already in place. The roof supports in the middle of the roundhouse were reconstructed using some of the parts from the original kit. The inner walls were lined with embossed red brick paper. Overhead lights were installed under the roof support beams. The roof was made removable. Rather than attaching the rafters to the roof beams, these rafters were attached to the underside of the roof so that they rested on the support beams when the roof was in place on the building. The roof was constructed from poster board with the roof vents and windows secured in place. Scored aluminum was cut into appropriate panels and secured to the roof. The roof was weathered by brushing on ground rust colored chalk. The whole structure was then dusted with powered graphite to give it a dirty well used appearance. When the windows were originally repainted, one window escaped and was not painted with the new paint scheme. When the reconstruction was resumed Floquil paint had been discontinued and it was not possible to match the color scheme used on the windows. The problem was solved when the roundhouse was placed on the railroad by including painters repainting this window. The original Scale Structures kit included a number of details of some of the equipment that might be found in a roundhouse. These were also metal parts that were retained. When they were placed inside the roundhouse it became apparent that even with the lights that were installed these details would not be easy for visitors to view. 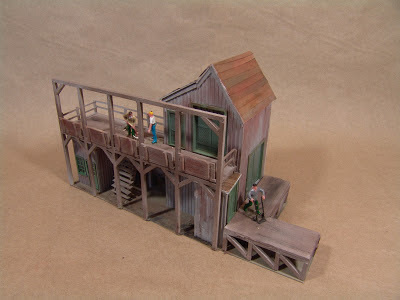 Thus a construction shed was added to the right side of the building where some of these detail parts could be placed for construction on the RIP track at the side of the roundhouse. 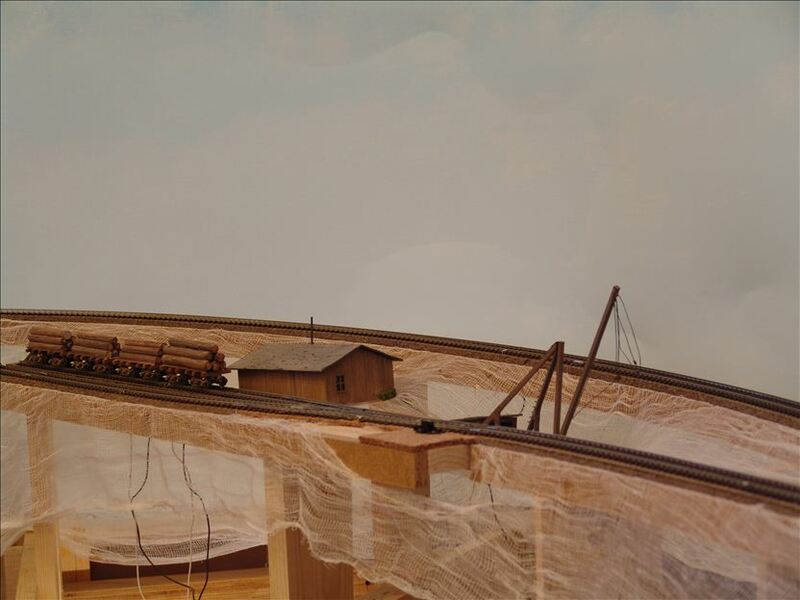 A crane was also constructed for this RIP track to give the whole scene a more used appearance. Appropriate railroad junk was placed near the RIP track including a set of locomotive drivers. The motive power of the ATSG now runs much better with a roundhouse for regular maintenance. When Echo Canyon was mostly complete the folks in Ascape turned their attention to finishing the yard and some industries in Ascape. Other posts will feature individual structures and their construction. The purpose of this post is to provide an overall view of Ascape, particularly the Engine Terminal, Yard and associated industries. Figure 1 View of Ascape Engine Terminal. Figure 1 shows the Ascape Engine Terminal (center), Ascape Station (left), and Ascape Power Plant (right). The main line and Ascape siding are along the back of the terminal. The caboose track is seen at the end of the Ascape siding. There is another passing siding in front of the station next to the main platform. The other tracks from left to right include the engine ready track serviced by the coal tipple, the sand house, and the oil terminal. This track connects to the turntable in the background. The roundhouse is under construction and is not present in this photograph. The track to the right of the engine ready track also leads to the turntable and is track for locomotives entering the terminal. The track to the right is the lead track for the Ascape yard. The yard ladder is switched from this track. The gondolas sit on the Power House stub. The station is a Fine Scale Miniatures kit, the coal tipple is a Campbell kit, the turn table is a Diamond turntable kit. The water tower is Walthers. The power house is scratch built from card stock with hand carved brick detail. The sand house (hidden by the oil depot) and the oil depot are Campbell kits. There is a old box car shed under the water tower. Saulina's Tavern and Harley's Cycle Shop are hidden behind the trees behind the station. Figure 2 is a view of the Ascape yard. The yard lead shown in Figure 1 feeds the ladder to these tracks. The track to the right is the main line with the turnout to the Ascape siding shown. Burgess Beef packing plant and Mauzy Ice are at the end of the yard tracks. Farmer's Cooperative elevator and feedstore are to the right of the main line in the upper right of the photograph. Craig's Camp is in the far background. 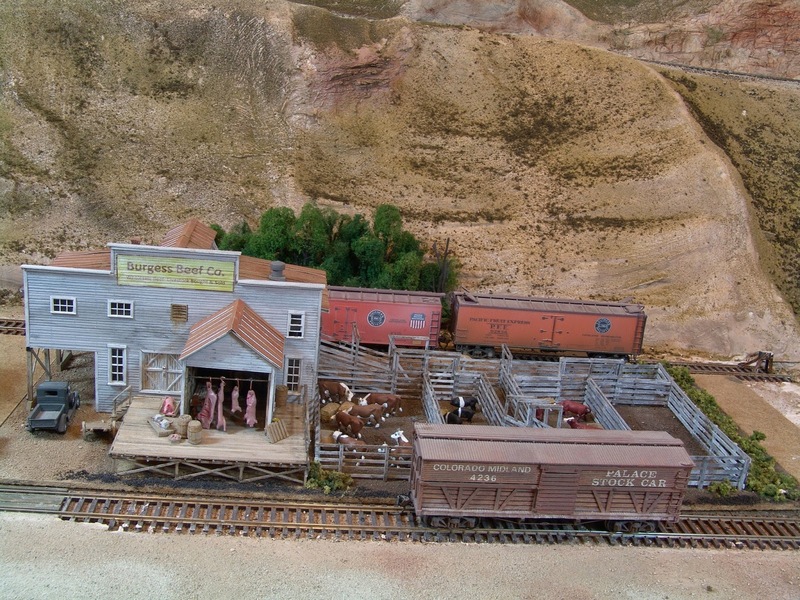 Burgess Beef is a Fine Scale Miniatures kit, Mauzy Ice is scratch built, the grain elevator and feed store are Walthers structures. The turnouts in the yard are powered by Tortoise machines from switches and indicator lights on the fascia. Figure 3 is a view of the station, water tower, and power plant. Echo Canyon tunnels 2 and 3 are in the background. This photograph was an earlier photograph that did not use Helicon Focus or the settings indicated below. Figure 4 was the photographer's first attempt to use Helicon focus with multiple exposures using manual focus (see photographic details below). Note that the cliffs are about 30 inches from the camera. The coal tipple is about 20 inches from the camera. The figures and gas pumps are about 8 inches from the camera. Enlarge the photograph by clicking on it to see the clear detail at every distance. Figure 5 is Burgess Beef packing plant. Bruce Burgess is a cattle man and close friend of the president. This structure and corral are a Fine Scale Miniatures Kit. The Cattle yard is small and can handle only one or two cattle cars in any one shipment. Reefers call at the platform to ship processed beef and pork to the market. Figure 6 is Mauzy Ice. This small structure is perfect for the very small operation of Burgess Beef packing plant. Reefers are iced one at a time and it is rare for more than two reefers to visit the plant on any given day. The ice house was named for Chris Mauzy, who is a frequent operator on the ATSG. This structure is scratch built from polystyrene siding and strip wood. The builder drew plans from photographs of an On3 model of this ice house designed and constructed by Troels Kirk of Sweden. 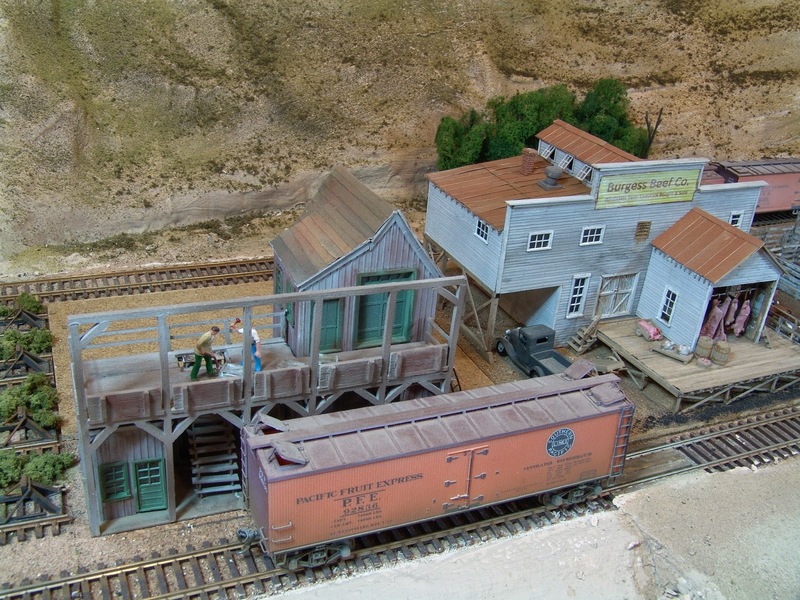 Farmer's Cooperative and Feedstore are Walthers kits weathered by the author. Craig's Camp is on the hill behind this scene. The main line is behind these structures and again behind Craig's Camp on the upper level. All of the photographs except Figure 3 were processed via Helicon Software and involve multiple exposures focused at different distances. The focus was set manually. The photographer measures the distance from the furthest object and closest object in the picture using a metric measuring tape. This distance is then divided into 5 or 6 equal lengths and an exposure taken at each distance. The camera indicates the distance when using manual focus: Sony 35 mm 8 mp digital camera, F8.0, color real, no zoom. Lighting is from overhead compact florescent spot lights enhanced by two photo lamps also with compact florescent bulbs. Exposure time is automatically determined by the camera. All photographs were taken on a tripod via the camera timer to avoid any camera shake. You should be able to enlarge the photographs by clicking on them. 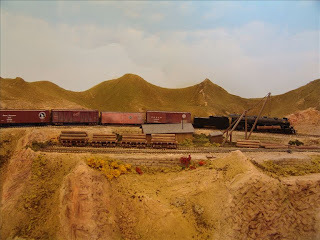 Perhaps the biggest challenge for the ATSG Railroad was how to provide creditable scenery when there is a high line behind and above the main line? Figures 1 and 2 show the problem. Several solutions were tried. The first was to try to hide the high line with buildings but this required either hiding the high line completely or trying to provide a rational why the high line was above the buildings. Not an acceptable solution. A second solution was to hide the high line completely as it returned to the helix. But this eliminated more than 20 feet of railroad that could provide additional running and scenery. A ride through Echo Canyon Utah provided a possible solution. See Figures 3 and 4. 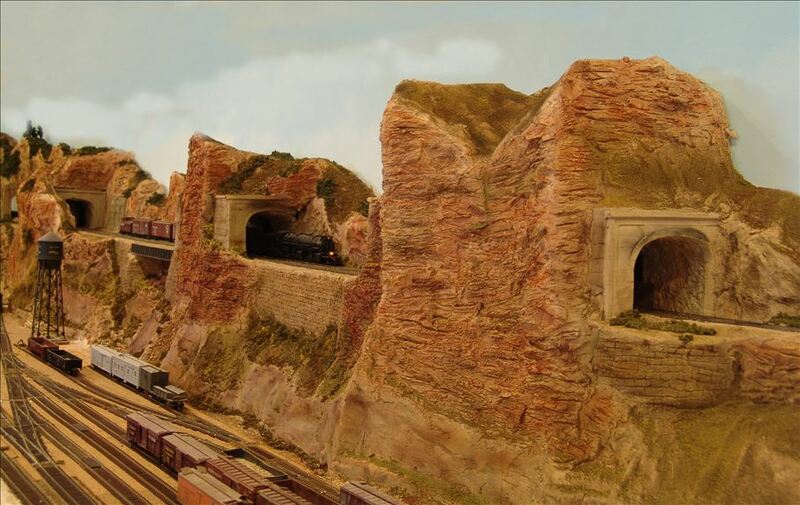 Why not a series of tunnels through the cliffs forming a backdrop for Ascape Engine Terminal and Yard? 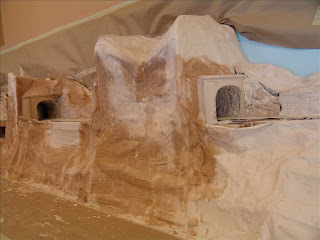 Figures 5 and 6 show the construction of Echo Canyon. The high line is partially hidden by the eventual cliffs and a series of tunnels carries this main line through the cliffs. Figures 7 - 13 show the details of the resulting canyon with carved rocks, sprayed paint with chalk weathering with foliage proved by Woodland Scenics. Portals were modified to appear to be partially built into the cliffs, the roadbed was hidden by a rock wall support between tunnels 2 and 3 and a bridge between Tunnels 1 and 2. Rock was hand carved, spray painted with diluted house paint, and weathered by raw pigments and colored chalk. The scenery was sealed with dull coat. The plan is to place photograph backdrops between the cliffs in Echo Canyon. 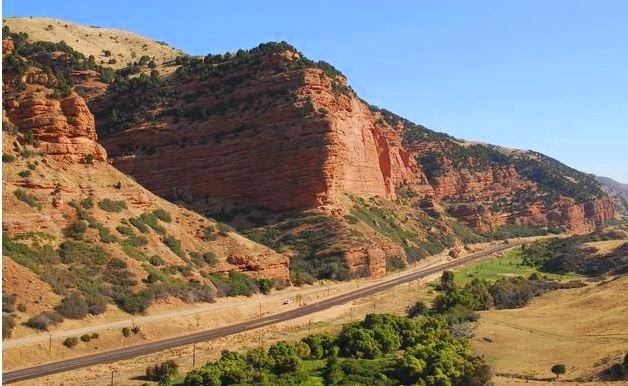 There is lots of red rock to choose from in St. George and Snow Canyon. We will illustrate these photograph backdrops in a future post to this blog. The cliffs of Echo Canyon make a very nice backdrop for Ascape. A future blog will illustrate Ascape with these cliffs in the background. The illusion of height used forced perspective by using small shrubs and trees high on the cliffs and larger shrubs and trees in the foreground at the base of the cliffs. Interest was created at the base of the cliffs by including a retaining wall in some placed, a rock fall in other places. Figure 7 West Portals Tunnels, No. 1, No. 2 and No. 3. The high line curves around the back corner of the layout above Burgess Beef and Farmers Cooperative. A short stub was installed here to serve a small logging camp. The challenge was how to fill in the corner and create a plausible scene. Small mountains were created to fill in the corner. Even though they are 3-dimensional the attempt was to make them appear to be further away than they are. We are still debating how to make them appear pine covered without causing them to appear closer. The scenery in front of the camp is behind Farmer's Cooperative and Burgess Beef. A freight train is passing on the upper main line behind the camp. Figure 2 Craig's Camp with upper main behind. Craig Harding, a model railroad club member spent many hours helping construct the return loop in the staging yard under the location of the logging camp. In honor of this arduous task the lumber camp was named in his honor. The camp consists of a small shed, a logging crane, and a log pond. Figure 3 shows a set of scratch built log buggies behind a Bachmann three truck Shay locomotive. To the far left is a Barnhart log loader that rides on the top of rails on the log buggies. This small crane can then crawl from car to car as it loads the logs. How can you have a log camp without any trees in the vicinity. Hopefully some trees will spring up in this location in the near future. Figure 3 is a Helicon photograph of Craig's Camp as described in other posts (See Post 30). 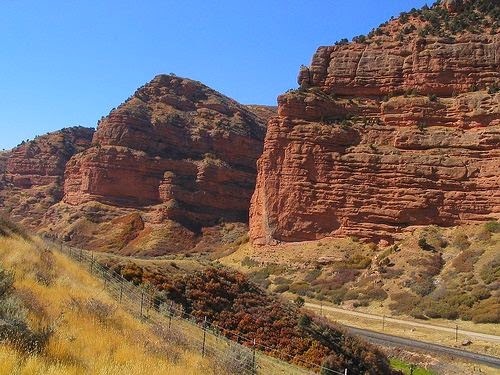 I'm finally back to posting to this neglected blog about the Ascape Tennsion & Sulphur Gulch Railroad. I will not try to include these posts in order but will merely date them as I post them rather than when they were constructed. I will try to give some details about the back story. 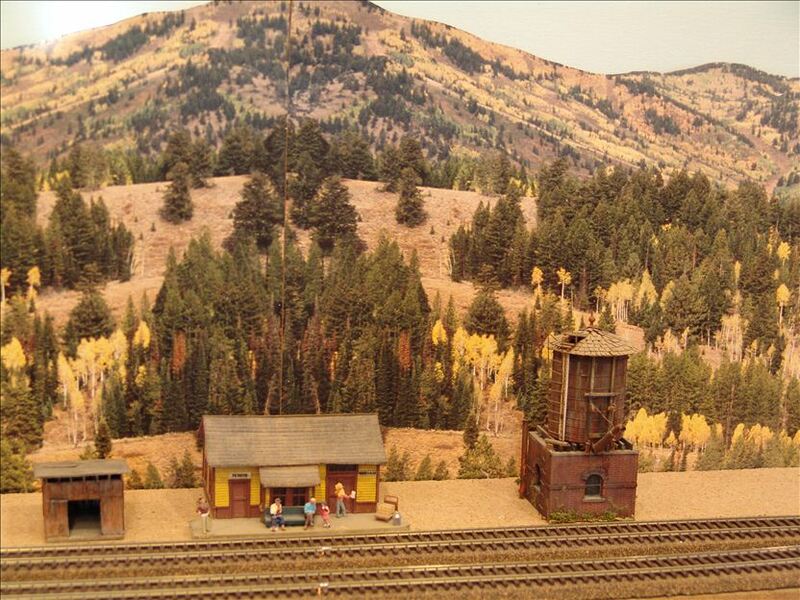 In 2009, installment #23, this blog described the construction of Whetstone Ridge, Sulphur Gulch, and the trestle at Sulphur Gulch. 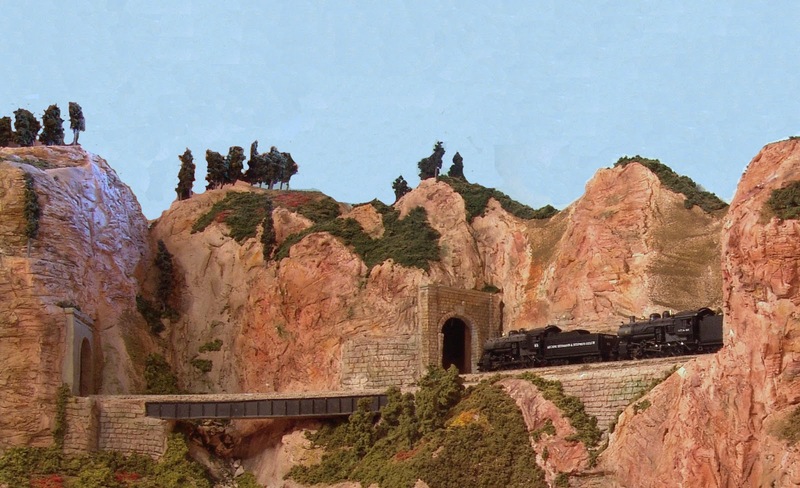 This bit of scenery served as the focal point for the railroad since that time and is sure to get a “Wow!” from visitors as they enter the railroad room. However the back side of Whetstone Ridge maintained its “under construction” status for the next several years. As the president was about to undertake a whole new construction project on the peninsula of the railroad the Chairperson of The Board subtly made the following observation: “Don’t you think it might be well to finish a bit more of the railroad before you undertake a whole new construction project?” Good observation. A wise president always listens to the Board Chairperson and thus construction on the back side of Whetstone Ridge was begun. This installment will describe the construction of Professor’s Plunge, Hardly Falls, the East Tunnel Portal, and the Park City East Tunnel Portal. This section featured in this post was finished for the 2012 November Open House. Figure 1 shows the helix with its cardboard safety wrap prior to the construction of Whetstone Ridge. The backside of Whetstone Ridge including Professor’s Plunge with Hardly Falls will hide the helix in this area. The track at the lower left is the mainline as it comes from the trestle at Sulphur Gulch and enters Ascape. The roadbed at the upper right is the mainline as it enters the helix at what will become East Portal and the branch line as it crosses through Whetstone Ridge through what will become the East Portal of the Park City Tunnel. Figure 2 shows the initial construction of the side and back of Whetstone Ridge. The cardboard armature in in place over this section of the helix and the cheese cloth has been glued to the armature. Figure 3 shows this same view of Whetstone Ridge. This section was the first scenery on the ATSGRR. It was deliberately left in this partially finished state to show the construction technique used on the ATSTRR. 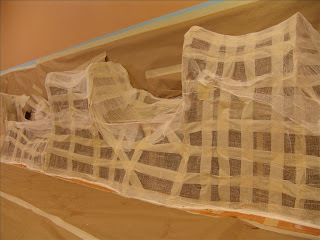 The near section shows the cardboard armature and cheese cloth prior to the application of a plaster coating. 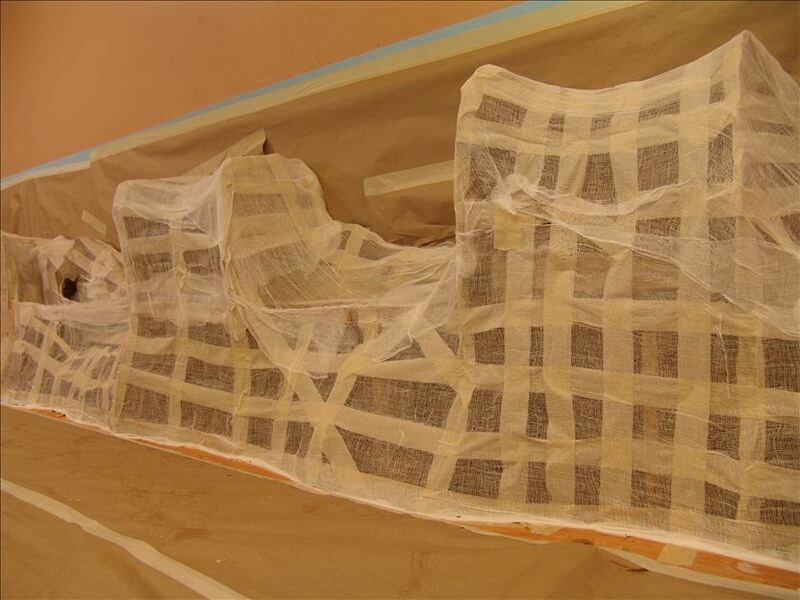 The next section shows the cheese cloth coated with a thin plaster shell and some rock castings have been placed over the shell. 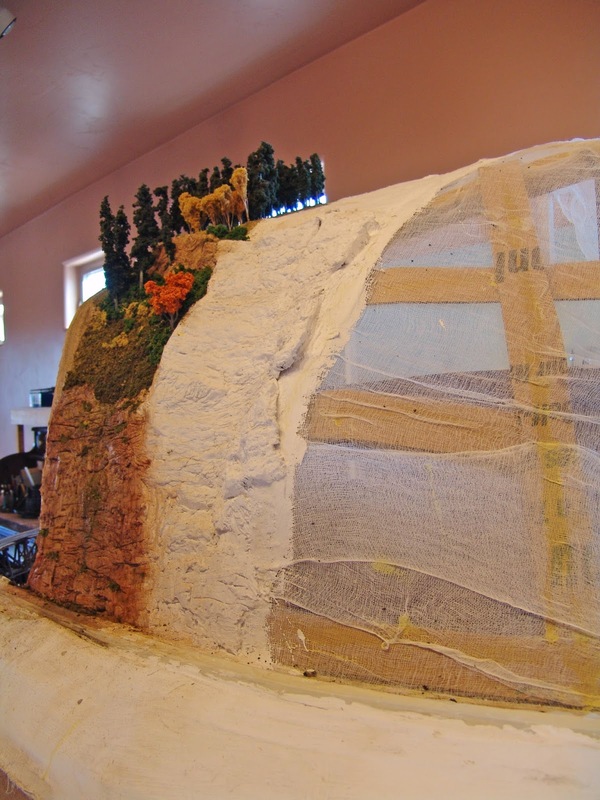 The third section is the first part of Whetstone Ridge that was completed to show the scenery technique. The Sulphur Gulch section of Whetstone Ridge was then completed as shown in an earlier post (#23). This section of the railroad stayed in this condition from 2009 until the construction described in this post was completed in early 2013. Figure 4 shows the area that is to become Professor Plunge and Hardly Falls with the cardboard armature constructed but not yet covered with cheese cloth. The armature has indentations where the canyon will be and a notch in the summit of Whetstone Ridge which is the head of Hardly Falls. The roadbed leading into the helix can be seen cutting across the front of the scene. East Portal will be constructed where this track enters the cliff to join the helix. The roadbed leading to Park City can be seen in to the right of the picture. The Park City Tunnel East Portal will be constructed where this track enters the cliff to cross to the rear of the helix. Figure 5 shows the aisle side of Whetstone Ridge after the scenery has been completed over the armature and cheese cloth that had occupied this location for several years. After experimenting with rock molds it was finally decided that hand carved cliffs were not only more efficient but could include a far greater variation of rock formations than is easily accomplished with rock molds. Figure 6 shows the East Portal of the Park City tunnel and the bridge leading to the East Portal of the Main Line Tunnel. Figure 7 Ascape Engine Terminal with Professor Plunge in the background. Figure 7 is a view of the Ascape Engine Terminal with Professor Plunge and Hardly Falls in the background. The train is entering The westbound main line from the East tunnel. 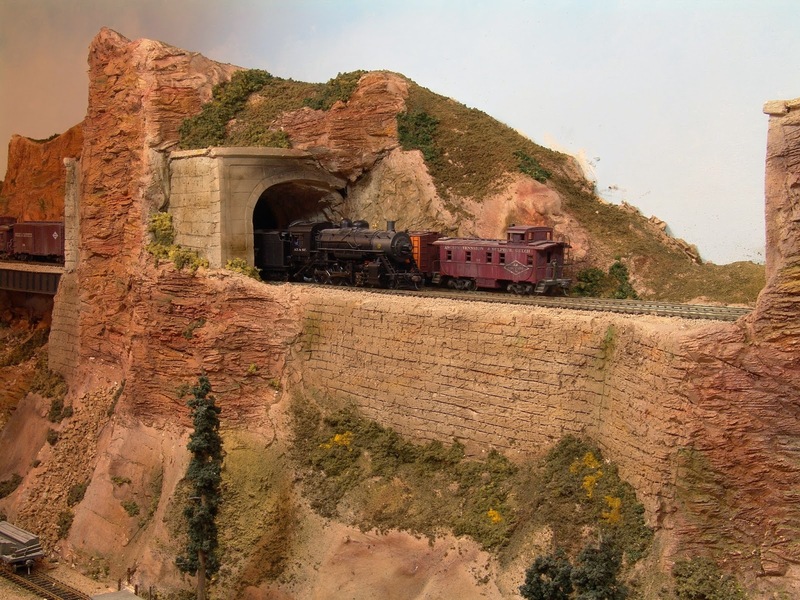 The caboose is entering the East Portal of the Park City Tunnel. Saulena's Tavern and Harley's Cycle Shop are in the foreground. 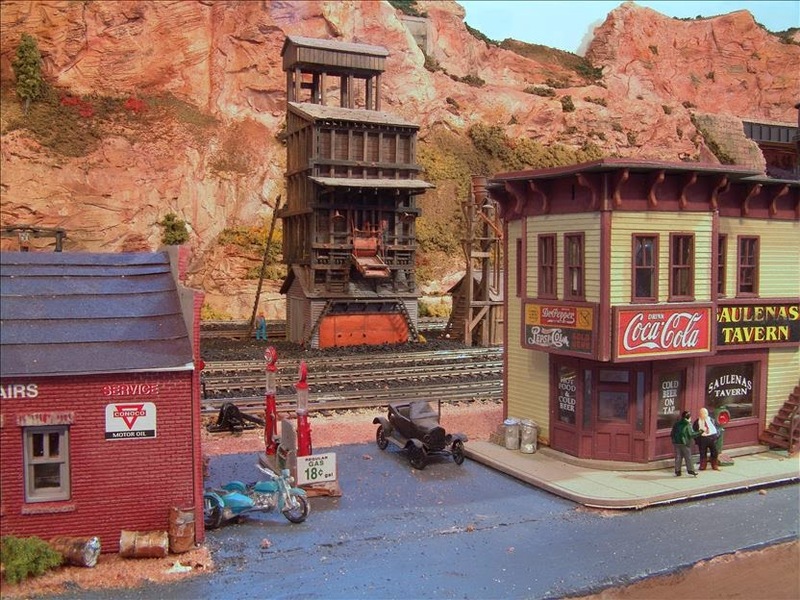 The Ascape Engine Terminal Coal tipple and Sand House are to the left behind Saulena's Tavern. The ATSG Railroad blog has been seriously neglected. There have been many developments on the railroad since the last post. 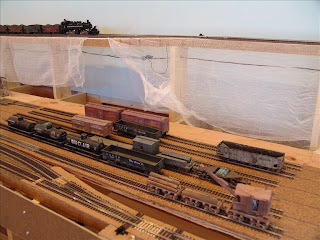 Fortunately the railroad itself has not been as neglected as the blog. The author kept waiting to catch up before posting the most recent material but then ended up posting nothing. So, with this post, the blog will try to at least stay current and then, as time allows, go back to post information on previous developments. 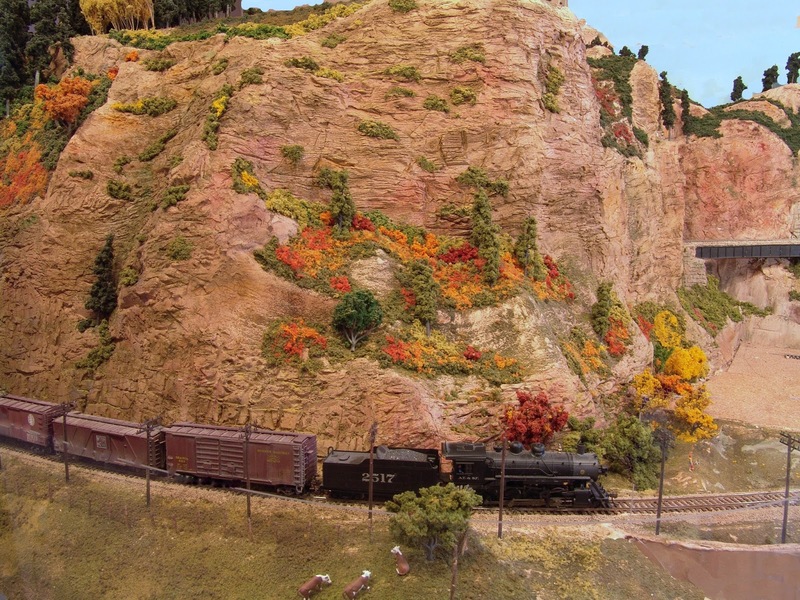 For the past several months the author has been trying to finish the Ascape section of the railroad. It started with the creation of (to be named canyon) which completes the mountain over the helix. This was followed by the development of Echo Canyon which is behind Ascape. The next goal was to finish the landscape, ballast, and details of the Ascape engine terminal and yard. This is all by way of background information for the current post. Later posts will describe these developments. 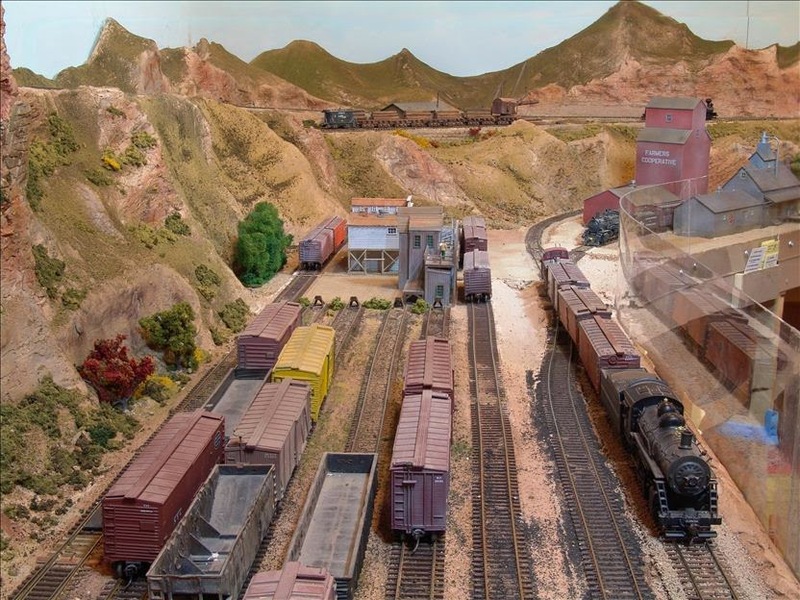 The Albuquerque NMRA Rocky Mountain Regional Convention included some inspiring model work by some outstanding modelers. It inspired the president of the ATSG Railroad to revisit and improve his skills in model building. At far end of the Ascape yard is a vacant lot where Burgess Beef Packing Plant will be located. Behind the packing plant is an ice track where refers can be iced before being loaded with processed beef from the packing plant. Ascape is a very small town in the 1930's. The buildings are old and somewhat rundown. Somehow the modern ice platform that had been previously constructed did not fit the location. 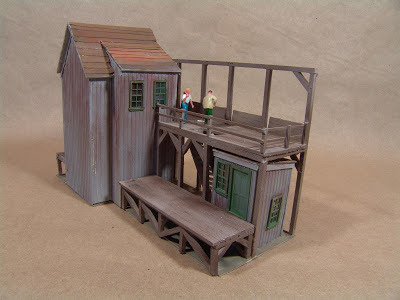 A search of the Internet revealed a wonderful model of a small old ice house that seemed just right for the location. The On3 model was designed and constructed by Troels Kirk (http://coastline.no13.se). 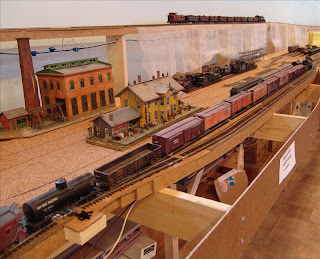 You can see some wonderful pictures of this model at http://www.railroad.line.com. 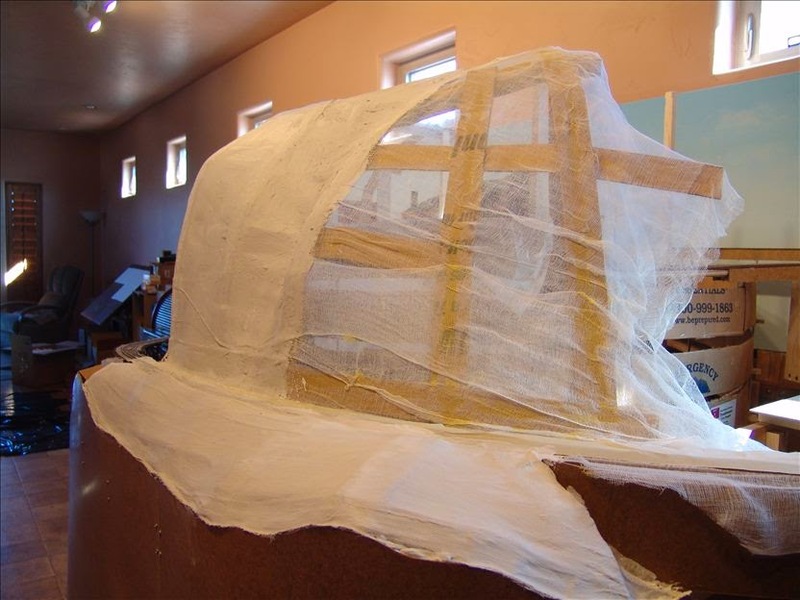 Our model of Mauzy Ice is shown in the photographs. The building and sheds were constructed from board-and-batten polystyrene. The loading docks and ice platform were constructed from strip wood. The doors and windows are from Tichy. 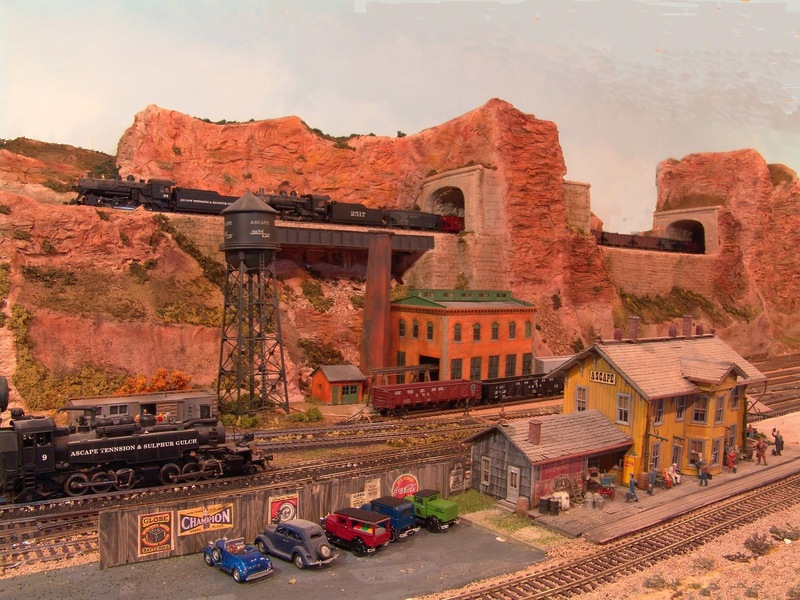 The structure was named for Chris Mauzy, a member of the Color Country Model Railroad Club, who is a frequent operator on the ATSG Railroad. The roadbed against the back wall is very narrow. This junction will eventually connect to the branch line to Tennsion (a story yet to come). We needed a way to extend the depth and create some activity at Sage Junction. I had a photograph mural created for a former version of the ATSG Railroad. I felt that it might work in this location. There is only 3 inches between the track and the backdrop. A small station and a water tank were installed behind the track. There is a small parking lot behind at the left of the station. The road from the parking lot goes behind the station and seems to extend into the backdrop. The scenery in front of the photograph was constructed to match the backdrop photo. The water tank is a Campbell kit and the station was another kit from an unremembered manufacturer. Figures, a woody station wagon, and other platform details were added to complete the scene. The terrain in the foreground fills the space between the lower main line and the upper line at Sage. Can you tell that our engineer is fascinated by rock retaining walls and roadbed support? The photographer for the ATSG is getting better. He discovered Helicon focus. Several photographs are taken at different focal lengths focusing from the furthest element of the picture to just in front of the nearest element. The photographs are then combined via Helicon focus to produce a picture that is in sharp focus at every distance. The scene was lit by two lights plus the overhead light. The color is by setting the camera on real. The aperture is set to the smallest opening, only F8 on my camera. The focal length is 50 mm without any zoom. Follow the construction and operation of the ATSG Railroad at its new home in St. George, Utah. 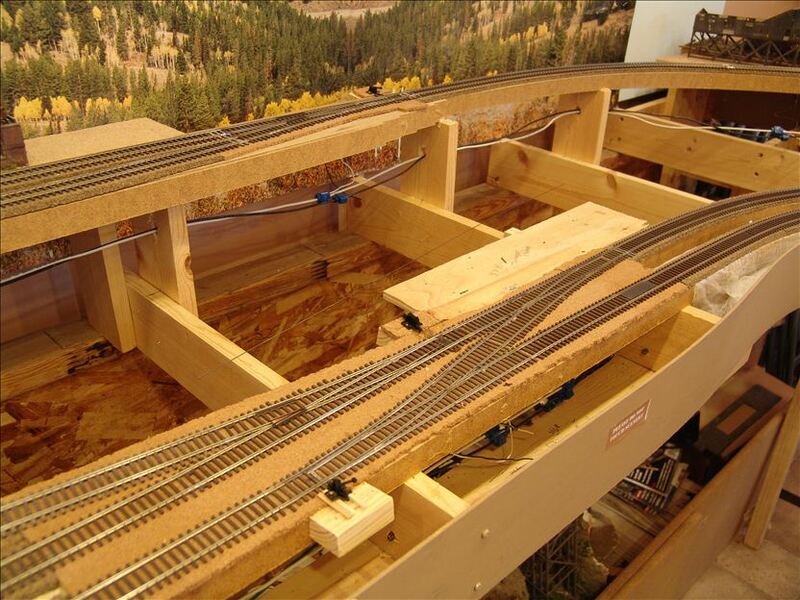 This model railroad was started in 2007 but was interrupted by a mission to BYU Hawaii during most of 2008. Visitors are welcome. Contact the management at ATSGRR@gmail.com to arrange a visit. Posts are numbered but appear in reverse order with the latest posts appearing first.